NEW YORK, NY— The Ministry of Foreign Affairs of the Czech Republic has chosen the New York City firm of Fradkin & McAlpin Architects, in collaboration with Czech firm A69 Architekti, to overhaul the 35,000-square-foot Czech Mission to the United Nations at 1109 Madison Avenue in the Carnegie Hill Historic District. The project will entail a gut-renovation of the interior and the creation of new living spaces, offices and meeting spaces for the staff of the Mission. Construction is expected to begin in the fall of 2017. This is the second collaboration between Fradkin & McAlpin and A69 Architekti. The two architecture studios worked together on Central Park Prague, a Czech condominium complex that opened in 2009 and won the Society of Czech Architects’ 2010 Grand Prix Architektu (Grand Prize of Architects) for New Construction. The planned redesign of 1109 Madison Avenue comprises a complete reconfiguration of the building’s interior and an upgrading of all building systems, including the elevator. The building’s exterior will also undergo an upgrade that preserves its Beaux Arts character. 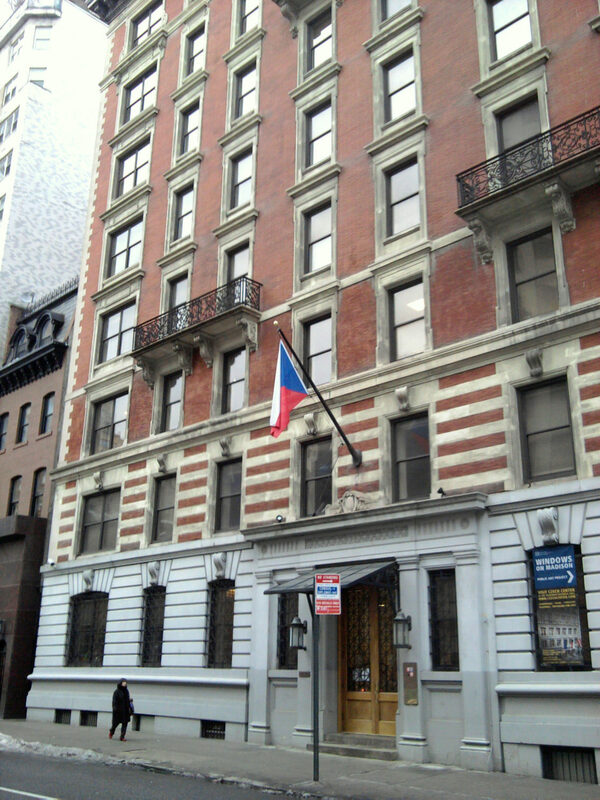 What is now the Czech Mission was built in 1898 as luxury apartments, a then-new residential option for wealthy New Yorkers. The popular Gilded Age architectural partnership of William Schickel (1850-1907) and Isaac E. Ditmars (1850-1934) designed the early apartment building, which remains largely intact. The red roman brick façade is accentuated by rusticated limestone base, quoins and trim. This restrained Beaux Arts composition is further enhanced by an Italianate metal cornice, decorative wrought-iron French balcony railings, and granite trim. Czechoslovakia bought for the building in 1958 for use as its United Nations mission. Since 1993, the Czech Republic has used the property for the same purpose.